I remember back in 2014 one of the newest beer crazes coming out of the craft beer scene was session style beers. Essentially, they were the typical styles of beers we know and love, but at a lower alcohol percentage. Many beer geeks thought the trend was either stupid or well.. just strange. To most beer geeks, including myself.. why settle with a lower ABV beer when you could just drink a smaller portion size of a regular beer instead? To some, they want the whole beer, but without all the alcohol. For the most part sessions disappeared, but a few breweries are making them still. Then there's the Molson Canadian 67 line of beers. I find that The 67 brand is trying to be aimed towards the bro who goes to the gym and loves to eat greasy double bacon cheeseburgers.. in fact, that's exactly what one of their television ads was about a few years back.. and it failed. In reality, the 67 brand has only succeeded towards my mom's group of friends.. women who don't really like the taste of beer but want a beer, especially something they can drink more than one of without worrying about too much caloric intake because every 341mL bottle has only 67 calories (70 calories for 355mL can). I've never seen anyone but my mom drink 67 so I suppose she's the soul person who's keeping the brand afloat.. because someone has to drink the brand. NOW there's Molson Canadian 67 Session IPA, which I know will be aimed even more to the bro crowd even more. Every brewery has an IPA in this day and age.. and hell, even Molson 67 has one now, a session IPA at that. I find it weird but I suppose they are trying to capture the demographic who will buy a flat of Bud Lights on a weekend, but will it succeed? Probably not. The average craft beer drinker doesn't care about how many calories there are in a serving of an IPA, and the average lager fan doesn't like the taste of hops - so.. who will actually drink this? I don't know. So that's why I'm here - to try this beer so you don't have to! 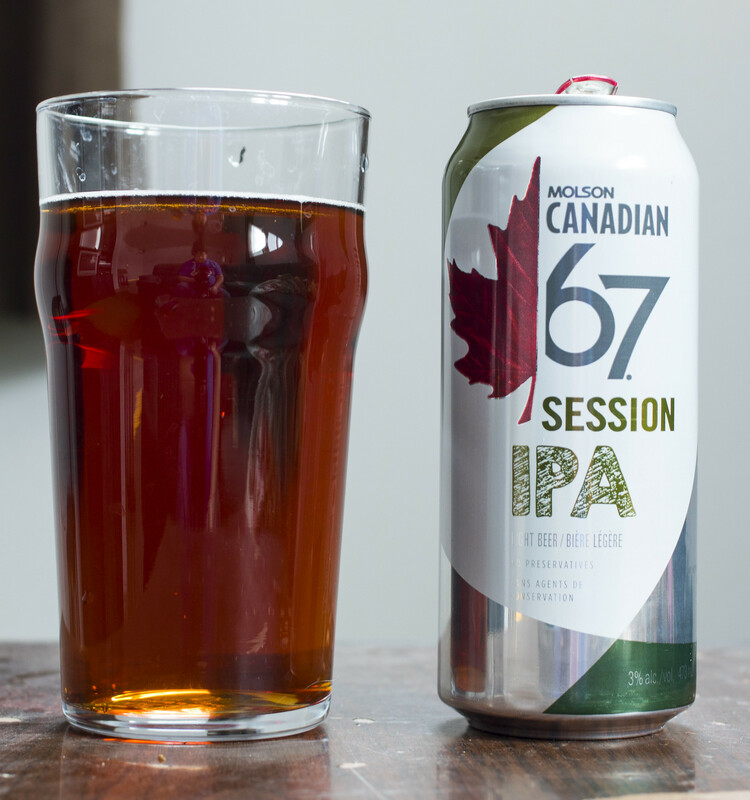 Molson 67's new Session IPA comes in 473mL cans, has 3% ABV which is half the alcohol you would typically see in a traditional IPA and tops out at 90 calories (67 calories if it was a 341mL serving). Appearance: Molson 67 Session IPA pours a medium honey brown, reminiscent of an actual beer rather than the watered down stuff that the typical 67 sees. There's a lot of carbonation taking place in the beer, to the point where the foam fizzes into nothing like a soda.. which isn't normal for a typical IPA, so I'm wondering what they're using in this Session IPA in the first place. Aroma: The first thing I noticed was that there was an actual presence of hops in this beer! It's a very aromatic citrusy vibe with rich notes of grapefruit, pine, lemongrass and dill. Honestly, I'm surprised how nice this beer smells.. especially for a Molson 67 product. Taste: Hmmm.. alright, well.. the aromatic zest doesn't really carry over into the flavour. I'm finding that it's fairly watered down and lacking in that grapefruit and pine that I enjoyed in the aroma. The only notes I'm getting here are faint notes of dill pickle chips and a sour yet tinny aftertaste. To be fair, a dill pickle saison would be effing delicious, but in the case of this session IPA, it's just annoyingly bitter and doesn't have any flavours complimenting each other. Thankfully, the dill pickle is there only for the 10 milliseconds when it hits your tongue, but the weird sour tinny aftertaste is just not something I'm liking. Overall Thoughts: Not a fan.. but what can you expect? This is a Molson 67 product. Over the years I've seen many Molson products get introduced with lots of attention only to fizzle completely (Molson Kick, Molson Canadian Wheat). I can't see Molson 67 Session IPA lasting more than a year or two, especially with Rickard's Red IPA being a better tasting option at Molson.. and not to mention the 10,000 other IPAs available in Canada. I've actually just stumbled upon this beer. I've lived outside the country for a while and I used to drink the regular 67 whenever I had "heavy drinking days" such as camping, bbqs, parties so I don't get hit too hard (not got too drunk or bloated after 5-8 beers). Btw, I'm a girl that loves craft beers of all kinds, and would go out of my way to get every new one that just popped in my specialty beer store. IPAs are among my favorites, along with stouts and scotch ales. But since I did a bunch of things; my boyfriend and I moved country, and we also changed our diets heavily. As in, no sugar/carbs, all week (basically keeping it under 25-30g/day). I do get a cheat day, which is when I get to FINALLY have a nice craft beer, but during the week, I still want my fix! Hence the savior coming in; Canadian 67! I'm not a fan of Buds and Coors Lights of the world, so this is pretty much as good as it gets for me, thanks to its 2 grams of carbs. So a few weeks ago, going to the beer store and what do I see??? *OOOOOOOOOOO (Angels singing) Canadian 67 IPA Session! Yes, this baby was coming home with me. Now, of course it's very diluted compared regular IPAs, but you still get some of the qualities of it. I understand that most beer lovers will usually not go for these kinds of beers and just go for the real thing, but for people who can't drink "carby" beers yet still enjoy beer (for real), then this is a great product.